What Are the Requirements for Women Seeking to 'Get Their Tubes Tied'? An online image highlights the "paternalistic" treatment some women face when they seek tubal ligations. The statement was likely included as a dramatization rather than a literal recounting, reflecting the difficulties many women encounter when seeking the procedure. Physicians will sometimes decline to perform the procedure on women who are young (because they might regret the choice later on), who are childless or have an only child (because they might want more children), or whose partners/spouses are not involved or fully in accord with the decision. 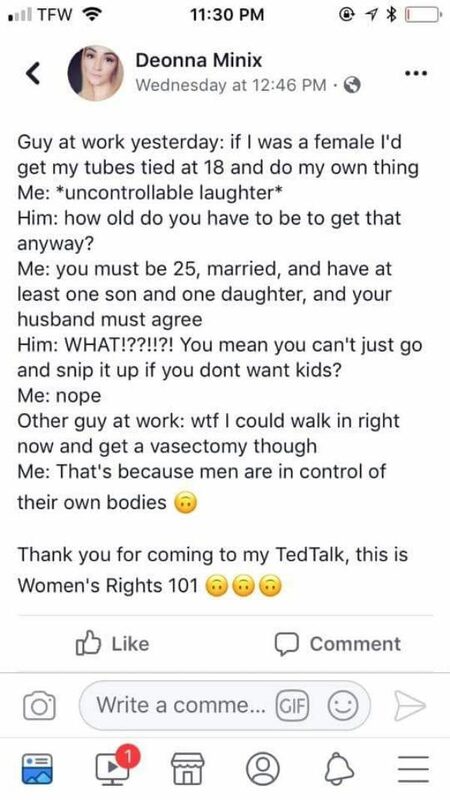 I got a tubal at 26 years old and had to fight to get one despite a) living in NYC, b) being married to a man as adamantly child-free as me, c) working in not one but two fields that are well-known for being unfriendly to kids (law and entertainment). The paternalistic treatment of doctors telling me they were going to “talk [me] out of it” still ticks me off (this happened in 2007) but what really took the cake was one doctor who outright lied to us about his willingness to respect my reproductive rights and our right to make decisions for our own family. He ended up changing his mind about doing the surgery and I found a specialist in Manhattan to do it after deciding I was going to lie about the circumstances for getting one. In reality, there is no strict minimum age for adult patients seeking to undergo tubal ligations if they pay out of pocket or through private insurance plans. Patients using federally-funded insurance plans such as Medicaid, however, must be at least 21 years old and not “mentally incompetent”, and the procedure must take place at least 30 days after the patient has been “voluntarily given informed consent” regarding the process. Most states with a Family Planning waiver or SPA also cover the procedures for women, but there are exceptions. Ohio and Oregon do not cover tubal ligation (neither general nor post-partum) in their family planning programs. Connecticut, Georgia, Missouri, and Mississippi do not cover tubal ligation performed post-partum in their family planning programs, with Georgia noting that pregnant women are not enrolled in the state’s family planning waiver. It is ethically permissible to perform a requested sterilization in nulliparous [childless] women and young women who do not wish to have children. A request for sterilization in a young woman without children should not automatically trigger a mental health consultation. Although physicians understandably wish to avoid precipitating sterilization regret in women, they should avoid paternalism as well. Henry J. Kaiser Family Foundation. 15 September 2016.